Until recent years Chandrabhaga was considered a place of natural cure for lepers. Mythological 'Shamba' (Krishna's Son) the cured lapper worshipped the Sun God for cure on the river mouth of Chandrabhaga, the river dried. It is reduced to a dry bed or a narrow trickle. It has been an ideal place for religious activity. Naturally the place is away from human vegetation. Ever swept by sweet breeze and washed by untiring waves is best suited for offerings and also divine romance. Chandrabhaga is situated 3 Kms east of the famous Sun temple of Konark and 30 Kms from Puri & 60Kms from Bhubaneswar by road. The Chandrabhaga Beach is usually a quiet retreat into nature's inviting arms and is popular with tourists looking for solitude to reflect upon their sojourn so far. According, to yet another mythological reference, Chandrabhaga, the daughter of a sage, caught the attraction of the Sun God by her magical charm. The God came down to seek her hand in love. Chandrabhaga did not offer herself to the God. Maddened by romantic pangs, the God chased behind a frightened Chandrabhaga who jumped in to the river and killed herself, but succeeded in protecting her chastity. As a mark of tribute to her sacrifice, every year on the 7th day of the fullmoon fortnight of Magha month, lakhs of people from all over the state and outside gather to take a holy dip in the river that is reduced to a shallow pool, offer their prayers to the Sun God and enjoy the Sun rise. Chandrabhaga's sacrifice might have been forgotten, but the place which bears her name is remembered as a holy shrine and the place of the Rising Sun. It continues to inspire religious and meditative activities. It has been a big hunting ground for poets, artists and lovers. A moment’s pause at Chandrabhaga is a great fatigue healer. Numerous visitors to Konark make Chandrabhaga a positive stop. Several others stay at Konark overnight to enjoy the beauty of the following day. A light house, close by Chandrabhaga is an added histrionic to the splendor of the place. A climb to its top truly takes you to a world of utopia. A natural deer park is recent additions to the riches of Chandrabhaga. 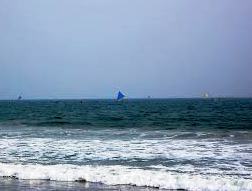 Chandrabhaga is also rich in her marine resources. A large colony of fishermen from Andhra Pradesh beside the dried river mouth represents typical tribal life of India. There is an ancient Matha believed to be the Ashram of Chandrabhaga's father and two small temples. The sight has aesthetic and importance.